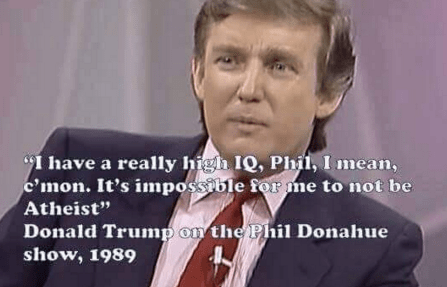 A meme that Trump told Phil Donahue that his high IQ makes it impossible for him to believe in God is based on a fake quote. Donald Trump told Phil Donahue that he was an atheist in 1989. Did Donald Trump admit to being a atheist on Phil Donahue's show back in 1989? We found no evidence that Trump uttered this phrase, and no evidence that he even appeared on The Phil Donahue Show in 1989. The media mogul was a guest on the show in 1987, but there is no record of him discussing his religious views (or, more accurately, his lack thereof) during that appearance.